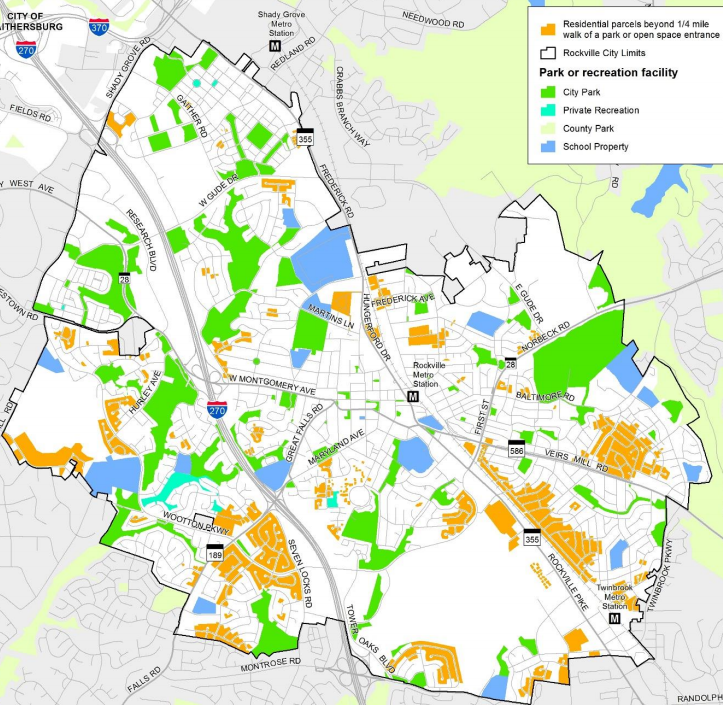 The Rockville Planning Commission will be briefed on, and discuss, the section of the 2040 Master Plan update on Parks and Recreation Facilities at their Thursday, November 9 meeting at City Hall at 7:00 PM. A draft of the plan sets out goals based on feedback from community listening sessions and previous discussions. Among the goals are leveraging private sector capital, property and resources; continuing expansion of well-connected bike facilities; improving cooperation with Montgomery College, Montgomery County and Montgomery County Public Schools, which all have facilities in or near Rockville; ensuring City parks and facilities have distinctive branding; ensuring no net loss of square footage of parkland (something the Montgomery County Council failed to do in recent years); and ensuring that all homes within the City are a quarter-mile walk from at least one park or recreation facility. Currently, 79% of Rockville homes are within the quarter-mile range. Underserved areas are primarily east of Rockville Pike, west of I-270, and in the town center. The latter could be very effectively addressed by a long-considered plan to bury the Pike in the town center area, and building a major park on top of it.